Although there are several types of printing processes, offset lithography — offset printing — is the way most ink-on-paper printing projects are produced. The printing presses that deliver offset printing are either web presses or sheet-fed presses. Sheet-fed presses print on individual sheets of paper rather than the continuous rolls of paper used by web presses. Sheet-fed presses come in different sizes. Small sheet-fed presses print on paper as small as 4 inches by 5 inches and the largest print on sheets up to 26 inches by 40 inches. Sheet-fed presses print on coated and uncoated paper and cardstock. The press may consist of one unit capable of printing only one color ink at a time, but large sheetfed presses may have six or more print units that each print a different color of ink on the sheet of paper all in one pass of the press. Sheet-fed presses are more economical to run that web presses. They are smaller and require only one or two operators. Because they are easier to set up and run, they are good choices for relatively small runs of print projects such as business cards, brochures, menus, letterhead, flyers, and booklets. The flat sheets of paper run in a straight line through the press units, with each unit applying an additional color ink to the paper. The paper choices for sheet-fed presses is much larger than the paper choices for web presses. Web presses are room-sized and require several press operators and special equipment to move and install the enormous rolls of paper that go on the press. These high-speed presses are best for long print runs of many thousands or more impressions. Daily newspapers, books, and direct mail catalogs are usually run on web presses. 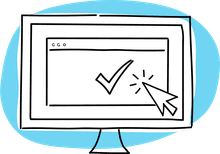 Web presses print on both sides of the paper at one time and most are equipped with finishing equipment that collates, folds and trims the finished product as it comes off the press. They cannot print on card stock or any paper that is too heavy to wrap onto a large roll. 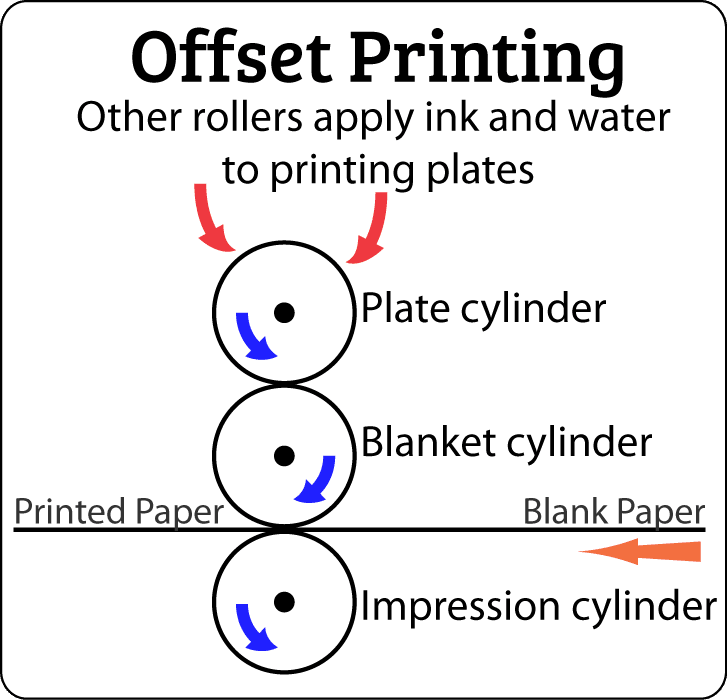 Offset printing uses a printing plate made of a lightweight metal that contains the image that prints on the individual sheets of paper. When ink and water are applied to the plate, only the image holds the ink. That image is transferred from the metal plate to a rubber blanket and from there onto the paper. Each color of ink requires its own metal plate. The "parent" sheets cut easily into the more familiar sizes we call letter-size, legal and tabloid. Commercial printers use the paper that best fits each print design. They usually print multiples on a single sheet and then trim them to the final size after they are printed. For example, company letterhead that is 8.5 by 11 inches prints four-up on 17 by 22 with no paper waste. Small offset printing companies that run only small sheet-fed presses often buy the small cut sizes of 8.5 by 11 inches, 8.5 by 14 inches and 11 by 17 inches and run those sizes through their presses.